K.K. Merker, letterpress printer, book designer, fly fisherman, pheasant hunter, jazz singer, poker player and poet, passed away on Sunday, April 28 in Iowa City. 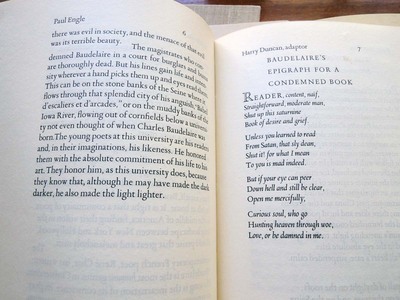 Princeton University Library is fortunate to hold at least one copy of each of his books, thanks to the generosity of Daniel and Mary Jane Woodward. The following information on Mr. Merker’s life is thanks to the University of Iowa Center for the Book, presented here with a few of our volumes. Kim Merker was the founder of the University of Iowa Center for the Book. His vision led to the creation of the UICB in 1986, the establishment of a certificate program in 1996, and an MFA degree in 2011. Through the Windhover Press, established in 1967 as one of the first teaching fine presses at a university, and the subsequent programs at the University of Iowa Center for the Book, Merker was a major influence in the establishment and growth of many fine printing and book art programs across the country. Kim Merker came to Iowa City in 1956 as a poet and a student in the Writers’ Workshop. While at the University he had the opportunity to work with Harry Duncan, who operated the highly regarded Cummington Press and who was then the director of the Typography Laboratory in the School of Journalism. Duncan and Merker collaborated on a number of publications. 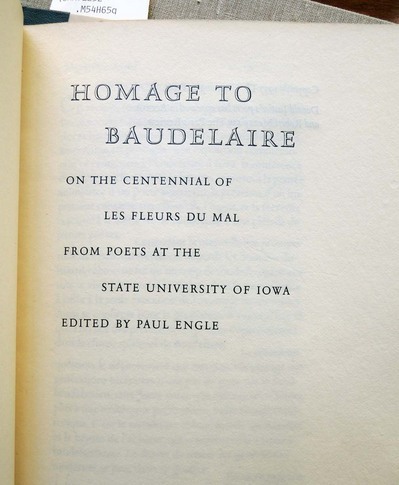 The Stone Wall Press was established by Merker and Raeburn Miller, a fellow student in the Writers’ Workshop who was soon to leave Iowa City in pursuit of an academic career. The Stone Wall books have been issued in editions of 200 to 300 copies. They employ fine printing papers, impeccably chosen type designs, nearly flawless hand-composition, meticulous printing executed on hand-presses, and hand-binding. The approach to design exercised in the books is pristine and classical in nature, and color is used with restraint. Theodore Roethke’s Sequence, Sometimes Metaphysical is a particularly elegant representation of the Stone Wall quality. The establishment of the Windhover Press by Kim Merker in 1967 at The University of Iowa innovatively situated a private press in an academic setting. Windhover was in part a teaching press. 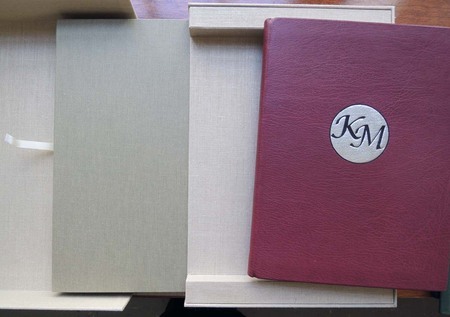 Students with interests in bibliography, publishing, or bookmaking were able to work directly with Merker and to participate in the design and execution of the publications. The Windhover bibliography includes translations, poetry by distinguished international writers and little-known or unpublished literature by such historical figures as Thoreau and F. Scott Fitzgerald. John Hoole’s Journal Narrative Relative to Dr. Johnson’s Last Illness, a manuscript of primarily scholarly interest, is representative of the diversity of Windhover’s publications. Edition sizes and production methods are similar to those of the Stone Wall Press, and the high standards visible in those books were maintained under Merker’s direction. Information in this announcement were derived from the following sources, which provide additional information on K.K. 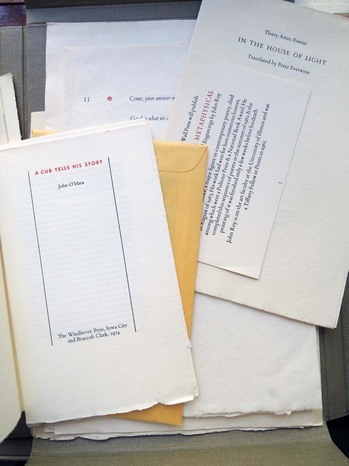 Merker, the Stone Wall Press, the Windhover Press, and a checklist of books by Kim Merker. 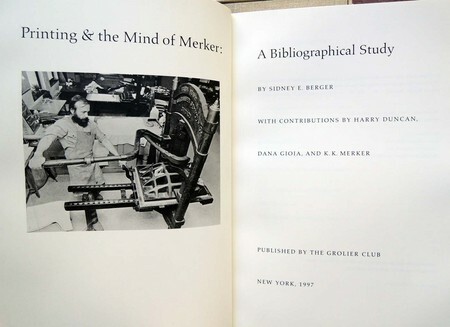 Berger, Sidney E., Printing & the Mind of Merker: A Bibliographical Study , Grolier Club, New York, 1997.